When considering ways to keep your plants well hydrated this season, consider something as simple as hand watering with a hose without a nozzle. Placing the hose at the base of the plant, this technique will allow you to direct the water to where it is really needed assuring the best results for your plant. If asparagus is planted in your garden, now is the time to fertilize it. Apply a fertilizer, following the label directions, or apply compost or aged manure to the asparagus bed. If using manure or compost, spread a layer approximately 1” thick over the entire area and work it well into the soil. As soon as the soil is workable in the vegetable garden, sow seeds of parsnips, peas and spinach. Now is a great time to apply wood ash over the vegetable garden before incorporating organic matter in preparation of spring planting. Two and one-half pounds per 100 square feet is all that is needed. However, do not apply wood ash to soils with a pH of 7 or more. Thriving in wet, and sometimes even flooded soil, Carex grayi ‘New Moon Mighty’ is an excellent choice. Forming slow-spreading clumps of 14” long, glossy, arching, evergreen leaves having a lime-green hue. In early summer, ‘New Moon Mighty’ produces striking spikes of starburst-shaped seedpods. Hardy in zones 5-9. If you are new to growing fruit trees or berry bushes, begin with cultivars that are easier to grow. It makes the most sense to begin with those that require less painstaking care such as disease-resistant apples. Strawberries, blueberries and blackberries are also excellent choices in the beginning. 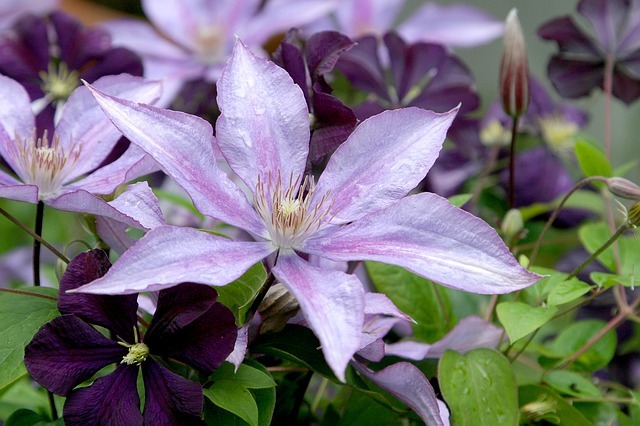 When purchasing clematis, look for a good, strong-growing, healthy plant. Two- or three-year old bushy plants that are well established in good-sized pots (approximately ½ gallon) and having two or three strong stems are an excellent choice.